লুয়া ত্রুটি মডিউল:অবস্থান_মানচিত্ এর 479 নং লাইনে: নির্দিষ্ট অবস্থান মানচিত্রের সংজ্ঞা খুঁজে পাওয়া যায়নি। "মডিউল:অবস্থান মানচিত্র/উপাত্ত/Israel" বা "টেমপ্লেট:অবস্থান মানচিত্র Israel" দুটির একটিও বিদ্যমান নয়।Location of Tel Aviv-Yafo in Israel. ↑ Jerusalem is the Israel's capital according to the Jerusalem Law passed in 1980. The presidential residence, government offices, supreme court and parliament (Knesset) are located there. The Palestinian Authority foresees East Jerusalem as the capital of its future state. The UN does not recognize Jerusalem as Israel's capital, taking the position that the final status of Jerusalem is pending future negotiations between Israel and the Palestinian Authorities "Map of Israel" (PDF)। (319 KB). 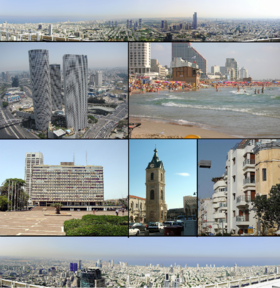 Countries maintain their embassies in Tel Aviv and its suburbs, or suburbs of Jerusalem, such as Mevaseret Zion. (see CIA Factbook) See Positions on Jerusalem: "No country in the world except for Israel has recognized Jerusalem as Israel's capital".